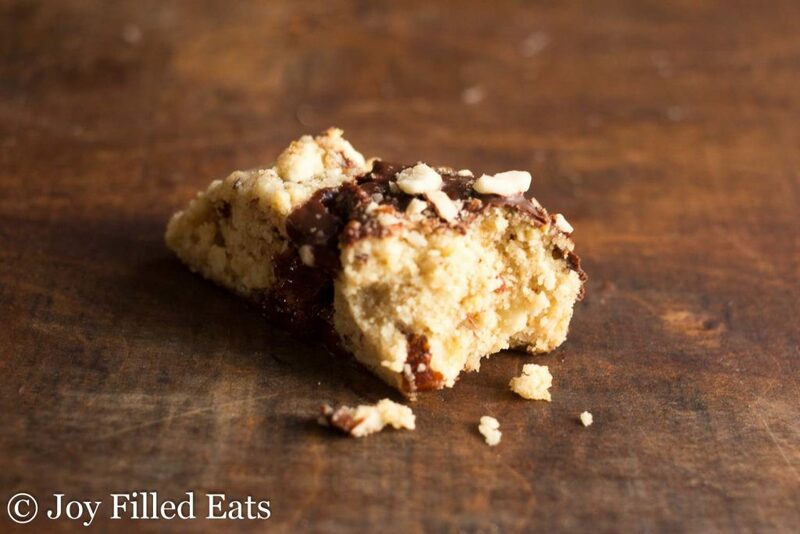 My Almond Biscotti Cookies Recipe is a perfect nightcap to a busy day. Sip a cappuccino and indulge in this sweet low carb cookie. My mother-in-law loves biscotti. So when we were headed out for her birthday dinner the other night and my husband said he was not buying a cake I knew what I had to do. 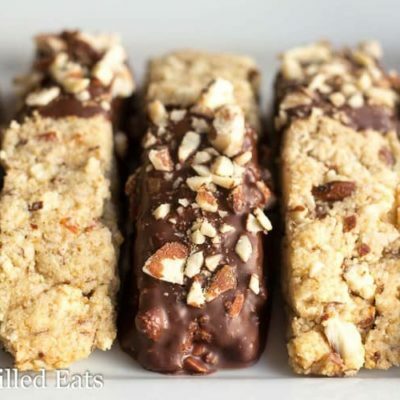 I wanted to take a classic almond biscotti cookies recipe and transform it into a healthier, yet indulgent, treat. 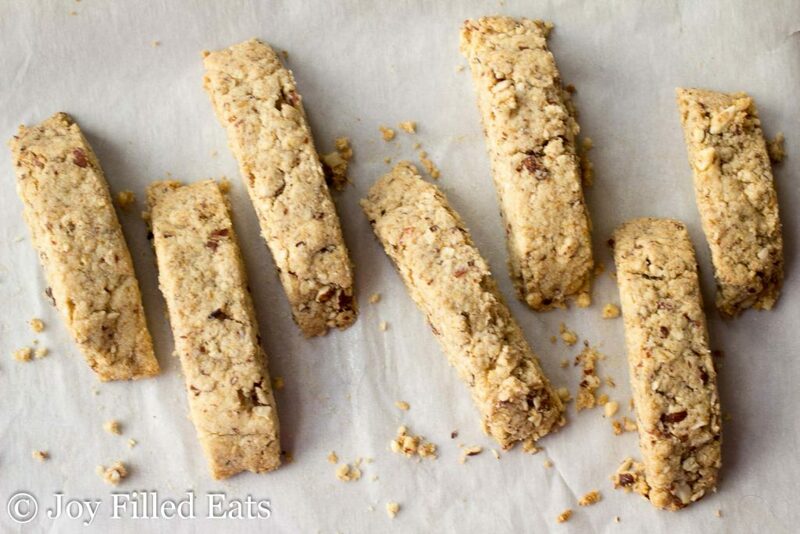 These almond biscotti cookies are a little softer than a traditional biscotti but with the classic shape and almond flavor, they are close enough for me. My Cuisinart food processor is my favorite kitchen gadget. It is ideal for slicing lots of vegetables, grating cheese, and making doughs. Out of all my small appliances I use it the most. I have this 11-cup model which had served me faithfully for 10 years but I have my eyes on the 14-cup. Maybe I’ll buy myself an early Christmas present. 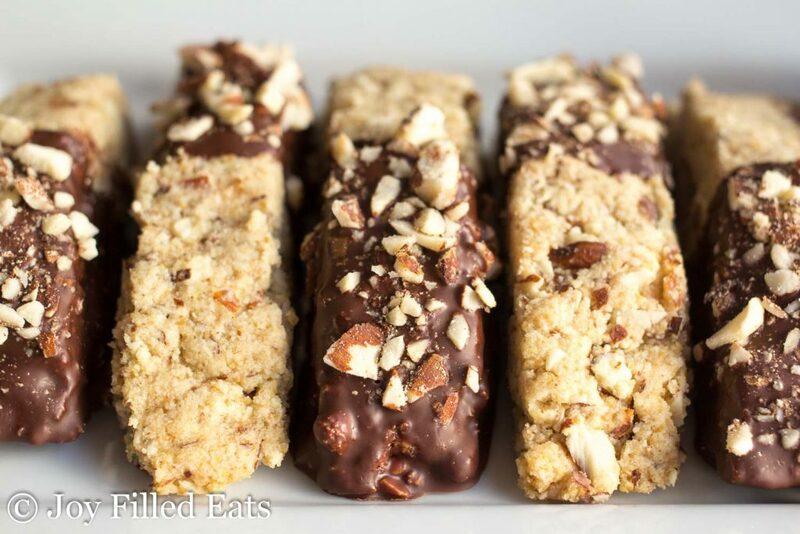 These low carb cookies are more fragile than a traditional biscotti. I worked around this by not picking them up. Simple press down a large knife to cut them and then wiggle the knife back and forth to make a space between them. I didn’t mind how fragile they are because they are delicious. I thought and trying to change the recipe to make them sturdier but I was afraid I would lose the delicate flavor and texture. This dough can also be used to make simple round cookies like shortbread. Just drop spoonfuls on the parchment paper and press them dough into circles. The chocolate and nut topping is optional but it is so pretty I recommend it. It also helps hold together these fragile, but delicious, cookies. 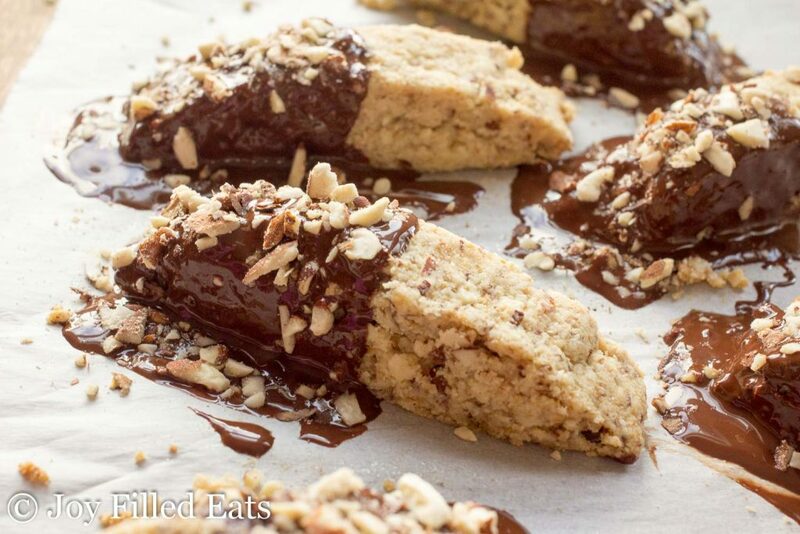 If you love chocolate go ahead and drizzle it on the entire cookie and not just half. 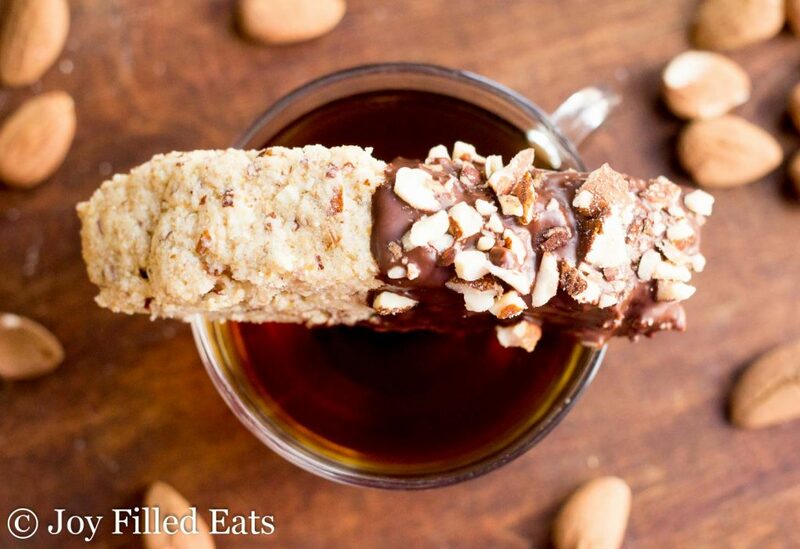 Chocolate dipped biscotti are the best type in my opinion. Combine the almond flour, flax, sweetener, coconut flour, gelatin, baking powder, and salt in a food processor. Pulse to combine. With the machine running slowly pour in the coconut oil, egg yolk, and almond extract. The dough will come together in a ball. 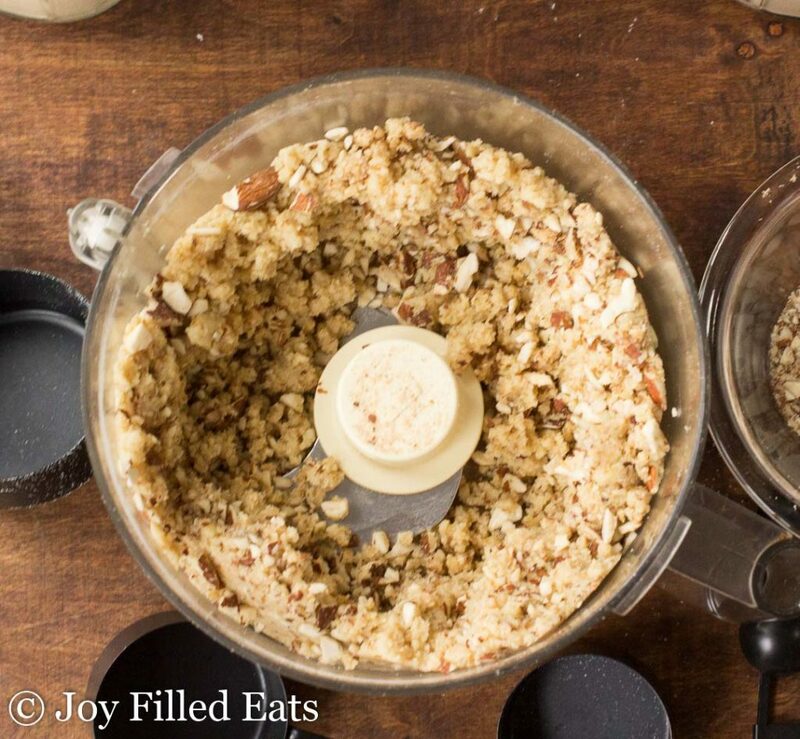 Scrape down the sides of the food processor and add the 1/2 cup chopped almonds. Pulse just enough to incorporate the almonds into the batter. 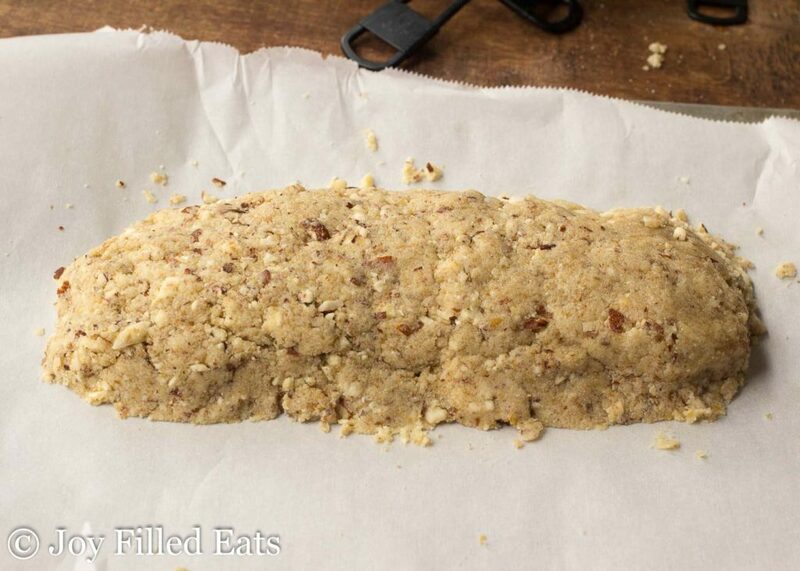 On a parchment-lined baking sheet form the dough into a long rectangular log, about 4 x 10 inches. Bake for 20 minutes. 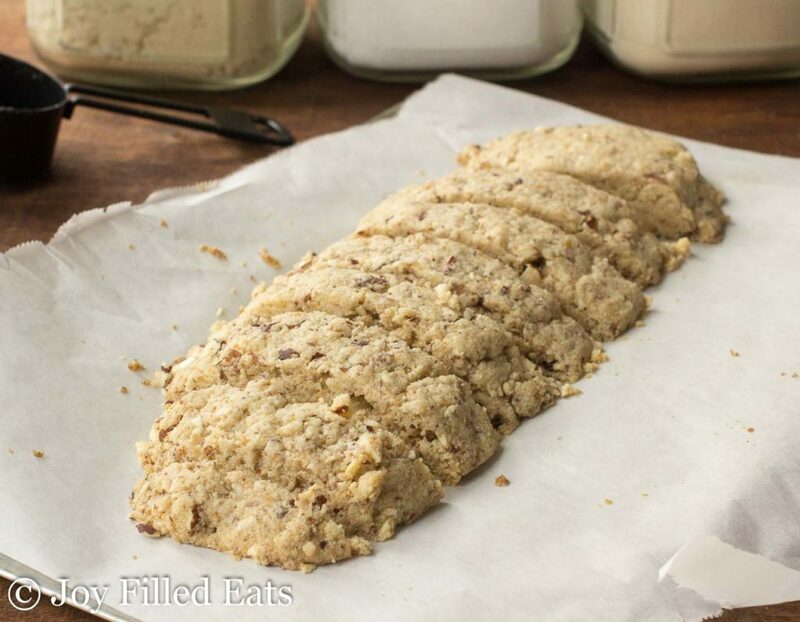 Remove the dough from the oven and cut the log into 10 pieces. Use a big knife and press down. Wiggle the knife back and forth between the pieces so that there is a gap between them. Return to the oven, reduce the heat to 225 degrees and bake for an additional 40 minutes. Cool completely. 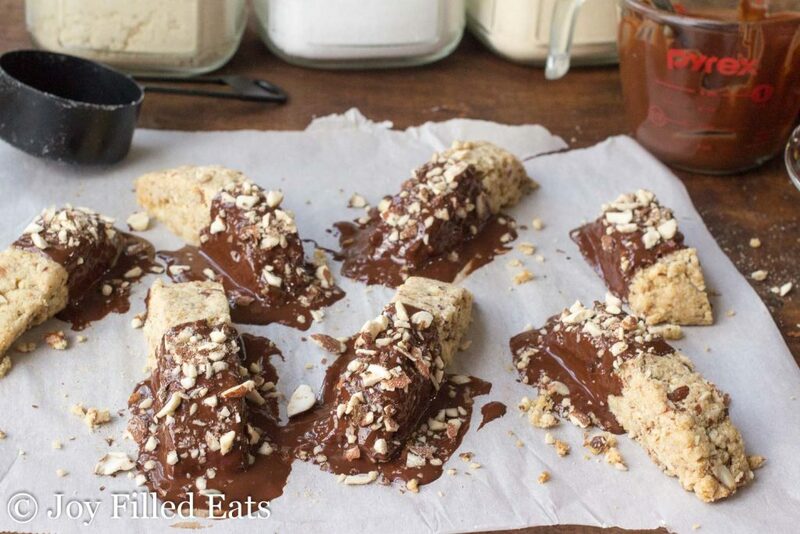 To coat the biscotti in chocolate simply turn on the side and drizzle and spread the chocolate on the bottom. Then flip upright again to coat the top and sides. Sprinkle with the additional chopped almonds. These are a little too fragile to dip into the melted chocolate. It works better to spread the chocolate on them. They firm up more when chilled. I made the biscottis twice already. They are great!!!! I added an extra 1/2 tsp of gelatin which helped hold these together a bit better. I also switched to Great Lakes gelatin which made a huge difference. Thanks for the tip, Kate! I'll give that a try. These look and sound amazing!!! I Love biscotti! but it is difficult to find good gluten free recipes. I also love using almond flour and coconut flour and I add ground flaxseed to so many recipes. your recipe is the first I have found that uses these ingredients. so will be making these real soon. Thank-you for all your trail blazing it is greatly appreciated. 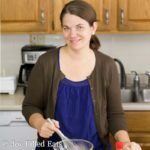 Can you use coconut flour instead of almond flour? I'm sorry but I don't think all coconut flour could work in these. Could you use honey or coconut sugar instead of the sweetners? I have not tested it but I think coconut sugar would work. Is the gelatin melted? Powder? What? Powder. It works as a binder since these only have 1 egg yolk for the whole batch. If you don’t like the taste of sweeteners like the ones in the recipe below, can you leave them out? I noticed the recipe calls for a 1/4 cup which is quite a bit of volume in the recipe. Could you replace it with something else? Which sweetener do you prefer? These look deeeelicious. Could I substitute collagen peptides for the gelatin? I think so but I'm not positive. The gelatin works as a binding agent.